If you're looking for a well-maintained Viking Enclosed Bridge Yacht with good fish (and food) karma, then Aldente may be the boat for you. Emeril Lagasse's 2012 Viking 70 EB, Aldente, is now listed for sale with United Yacht broker Captain Brad Benton and available to tour by appointment in Destin, Florida. The good fish karma on Aldente comes from Emeril's own foundation which hosts a yearly charitable fishing tournament called the Line, Vine, and Dine. Emeril fishes each tournament on Aldente and proceeds benefit local charities like the ARC Broward Culinary Institute and the Dan Marino Foundation. Putting the celebrity-status of this yacht aside, Aldente is absolutely immaculate. 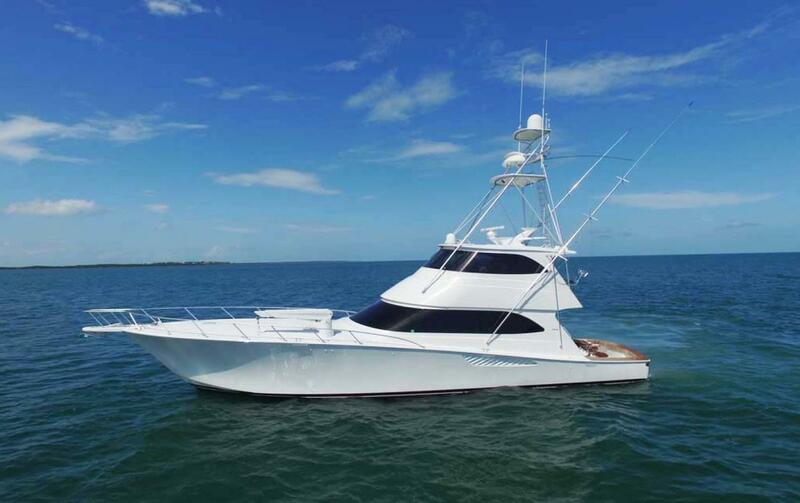 The Viking 70 debuted in 2010 and quickly became one of the builder's most popular models. Aldente has all of the modern-day amenities you could ask for including a Seakeeper Gyro that stabilizes the yacht whether at anchor or trolling. She is powered by the upgraded twin MTU 16V 2000 M94 2,600 HP engines that have just over 3,400 hours and are in great shape. Aldente is being offered for sale at $3,995,000. For more information on this amazing opportunity to own Emeril's Viking 70 Enclosed Bridge, please contact Brad Benton at (850) 321-1573 or by email at bradbenton@unitedyacht.com. Aldente wasn't just ordered with all of the base options. In addition to the upgraded MTU engines, Emeril's 70EB also features a Sea Recovery water-maker which is capable of keeping the available fresh water full for the crew on board during extended fishing trips as well as a Dometic ice chipper for keeping any catches fresh on ice. There are 11 tuna tubes installed on Aldente which are designed to keep bait alive that is normally difficult to keep alive once caught. This might include bonito, skipjacks, and mackerel, and can also give anglers a leg up during a tournament. At 206 square feet, Aldente's cockpit is definitely designed for battle in mind. This Viking 70EB features a Release fighting chair, teak cockpit, teak covering boards, and Viking's signature mezzanine for watching the action unfold. Anglers will also appreciate the bait stowage, raised in-transom livewell, insulated fish boxes, and the multiple rod holders everywhere. Also included in the cockpit are fresh and salt water wash-downs and a Gaggenau grill above the tackle station. This boat is as "turnkey" and ready to fish as you can get! As you can imagine on a Viking, the interior salon, dining area, and galley are bathed in beautiful teak cabinetry that has a high-gloss for a luxurious look. The open layout provides a great space for relaxing, socializing, or in Emeril's case, preparing an amazing meal for everyone on board. Aldente features an updated kitchen, a wine cooler, and all of the highest quality appliances available including a Gaggenau oven. The island bar and bar stools is a great place to enjoy time with the chef and the U-shaped couch in the dining area is a perfect spot to watch the flat screen television. The Bose LS sound system can get the party going or provide a theatre-like experience when a game is on. Aldente features a four stateroom layout with the master suite placed midships. The master cabin features a king-sized island bed with a System #3 upgraded mattress, 32" flat-screen television, and ample storage for those longer fishing trips and cruises. The guest VIP suite is placed forward and features a queen-sized walk-around bed with a System #1 upgraded mattress and 26" LCD flat-screen television. Portside is the third guest stateroom with upper and lower bunks and starboard is the crew stateroom. The engine room on Aldente is noticeably clean and well-maintained. There is an access door from the engine room to the crew quarters so the captain can privately enter when needed. For more photos and list of equipment, options, and exclusions, visit the Aldente - 2012 Viking 70 Enclosed Bridge listing page or contact Brad Benton at (850) 321-1573. Speaking of Captain Brad Benton, a recent article in Yachts International Magazine describes how Brad came to be the Captain of Emeril's Aldente. “I ran into Capt. Brad [Benton] 11 years ago, when I bought into a 65 Hatteras named the Ole Miss,” he says. “We got really into the tournament-fishing circuit. This was new stuff for us, so I hired Capt. Brad. He was a young gun at the time and people were like, ‘Don’t you want a more experienced captain?’ I said, ‘No, I want Brad. Brad’s good. He’s got heart. He’s got soul. We’ll learn together.’ As it turns out, Brad’s one of the best captains around now.” United Yacht Sales is pleased to have Brad on our experienced team of professional yacht brokers and boating experts. With over 150 yacht brokers worldwide, we have the network to help you find the perfect used Viking Yachts for sale on or off the market.